Rafael Zamora, Preceptor D.C. at Sycamore Valley Chiropractic. 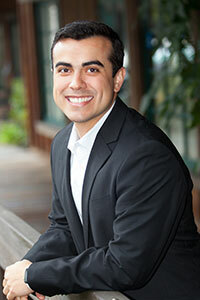 Dr. Zamora is honored to serve the East Bay since he is a Danville native. He graduated from Monte Vista High School in 2011 and went on to get his Bachelor of Science in Kinesiology from Cal Poly – San Luis Obispo. He received his Doctorate Degree from Life Chiropractic College West in Hayward, California. Throughout his experience, Dr. Zamora has been blessed to see wonderful results with his patients. He has frequently seen acute sport injuries, chronic headaches, neck and low back pain, tinnitus, migraines and have also reduced symptoms of shoulder, knee and foot pain. Chiropractic adjustments, myofascial release, low level laser therapy, ultrasound, low volt electric stimulation and athletic taping are some of the tools he uses to restore joint and muscle function while reducing pain. His passion is to help people achieve their optimal health through adjustments, therapies, exercise, and nutrition. How can we help? Please call us at Sycamore Valley Chiropractic or contact us today for an appointment!